Home Celebrity Gists Wizkid’s Response To Drogba’s Music Video Proposal. Wizkid’s Response To Drogba’s Music Video Proposal. 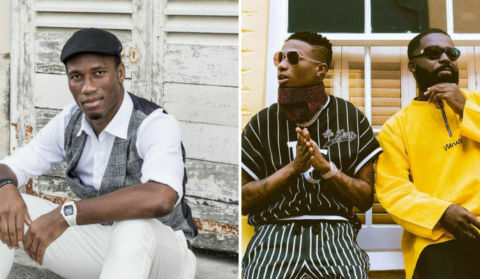 Afrobeat artistes, Wizkid and Afro B have agreed to have two-time African Footballer of the year Didier Drogba on set for the video of the song – Drogba [Joanna]. Earlier this year, Afro B, a London-based Ivorian artiste, released the tune with its unique dance , however, a remix with the Starboy record label leader, Wizkid has boosted its reception. The Chelsea legend is set to make a debut in a music video , the football icon is ready to go on the screen alongside the duo. The remix has received massive airplay across Africa and recently, hit a milestone on an online music streaming platform in less than a week. Aware of how viral the song has gone across the world, Drogba suggested for a video alongside the duo. Wizkid’s reponse was simple and affirmative.